Copyright © 1996-2018 Exclusive Mechanical Systems Ltd. All rights reserved. Extractigator ® is a Registered Trademark of Exclusive Mechanical Systems Ltd. The Extractigator Classic will remove most woody stem plants from paper thin up to 2” in diameter. Roots-and-all. The original product and most popular of all the models. Handle - High visibility safety orange tough powder coated surface. I just received the Extractigator! 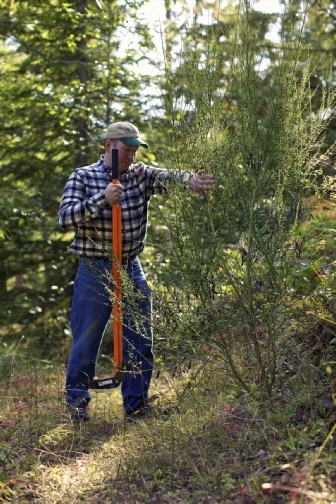 Buckthorn is an invasive species in Minnesota and eradication is recommended by the DNR. But as an older woman on five acres, it has been physically impossible for me to clear as fast as it spreads! I decided to purchase your product after looking at various options as I really need a tool to make this job easier! I was glad to see there was no assembly, and the jaws clamp tightly on the smallest plants! Out of the box and a quick half hour of work cleared a large area! I was concerned about the weight, but this device is very manageable! What’s that in US Funds?